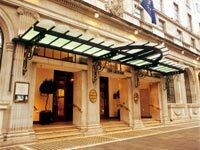 The flagship hotel of the Gresham Hotel Group, the Gresham has been serving Dublin for almost 200 years. In that time the hotel has evolved, and is now one of Dublin's most luxurious four star hotels. There's something in the air at the Gresham, a sense of grandeur and elegance synonymous with times past. Each of the Gresham's standard and executive en suite rooms and suites offer guests an extremely high standard of comfort, as well as offering them all modern conveniences. These include electronic locks, remote control televisions, direct dial telephones, voice mail, linen pressing facilities, hair dryers, and a 24 hour room service. And that's just the standard rooms! The Gresham is home to Toddy's and the Gresham bars, The Aberdeen Restaurant, and The Lobby Lounge. Toddy's provides a relaxed atmosphere combined with a level of service that's second to none. The Gresham Bar is an oasis of calm, discreetly tucked away between the Lobby Lounge and Toddy's Bar. The Aberdeen Restaurant provides the perfect place to enjoy breakfast, lunch or dinner. Sample the very best of Irish and international cuisine in a semi-formal setting. Located on O'Connell Street, the city's main street, the hotel is under two minutes walk from the shopping streets of Henry Street and Talbot Street, and is just five minutes from upmarket Grafton Street and fashionable Temple Bar. The hotel is also located just ten minutes walk from The National Gallery, Government Buildings, Merrion Square and St. Stephens Green.